Where you a Magdalene too? Five years ago in Dublin, Ireland, an order of nuns sold off part of its convent to real estate developers. On that property the remains of 133 women buried in unmarked graves were discovered. It turned out that the women had been incarcerated by the Catholic Church to work as virtual slave laborers in institutions known as Magdalene Asylums. The asylums were a network of laundries named after Mary Magdalene, who, according to Christian theology, was a prostitute turned devout follower of Christ. The Magdalene Asylums were set up in the 19th century, first as homes to rehabilitate prostitutes and then as industrial orphanages in response to the growth in the number of abandoned children resulting from the devastating Potato Famine of the middle and late 1840s. By the early 20th century, their role was expanded to function as workhouses for women who in a variety of ways had offended the country’s moral code. Run by the Sisters of Mercy in Ireland, the asylums functioned as commercial laundries, financing the order’s operations. Under pressure from the Church and its archaic mores, families sent daughters who were deemed wayward to the asylums. The girls were brutalized and worked long hours every day but Christmas, for no pay. The choice of work was not accidental. Called “Magdalenes,” or penitents, the inmates were intended to scrub away their sins by scrubbing clean the dirty laundry from orphanages, churches, prisons and local businesses. Many of the women were so broken in spirit and isolated from the outside world that they chose asylum labor over leaving the institutions, some remaining until they died. 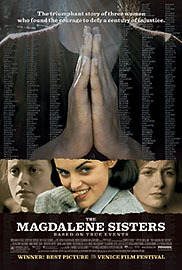 The Catholic Church in Ireland indentured more than 30,000 women and girls in the Magdalene Asylums. Amazingly, the last one was not closed until 1996.